After reviewing over 150 applications from the open call for women artists, STONELEAF RETREAT is excited to announce its 2018 Artists-in-Residence; Mahwish Chisty (Ohio), Theresa Chromati (Brooklyn), Liz Collins (Brooklyn), Rena Detrixhe (Oklahoma), Las Hermanas Iglesias (Queens), Emma Kohlmann (Massachusetts), Camille Lee (New Jersey), Katiushka Melo (Brooklyn), Mónica Palma (Brooklyn), Elise Rasmussen (Brooklyn) and Sinta Tantra (London). STONELEAF RETREAT is also proud to welcome Rebecca Reeve (Brooklyn) as its first All Season Artist-in-Residence. Reeve, from now until March 2019, will use the land at STONELEAF to create photographs from her temporal site-specific works and take part in the July-August 2018 residency program. This year STONELEAF has been focusing on what it means to ‘belong’, which influenced the choice of artists, whose diverse practices and backgrounds are complimented by disciplines which explore various subject matter such as immigration, labor, social activism, the environment, history, truth and feminism. Special visitors to the residency in 2018 included: Alyson Baker, Sonel Breslav, Sarah Cascone, Marina Garcia-Vasquez, Anastasia James, Candice Madey, Stuart Morrison, Bahia Ramos, Tiana Webb Evans, plus a large group of ArtTable members, who all enjoyed studio visits with the artists. BIO: Liz Collins surrounds the viewer in vibrating color fields to explore the boundaries between painting, fiber arts and installation. The cacophonic play of optics, texture, color and scale, recreates her wavering experience of the world as a place of stupendous wonder and cosmic energy. Collins has had solo exhibitions at the Tang Museum, Saratoga Springs, NY; Heller Gallery, NY; AMP Gallery, Provincetown, MA; and the Knoxville Museum of Art in Tennessee to name a few. Her work has been included in numerous exhibitions including at the ICA/Boston; Leslie Lohman Museum of Gay and Lesbian Art; the Museum of FIT; the New Museum; the Museum of Arts and Design and MoMA. Collins’ awards include a USA Fellowship, a MacColl Johnson Fellowship, and residencies at the Siena Art Institute, Haystack, Yaddo, AIR Alaska, and the Museum of Arts and Design. She is a Queer Art Mentor and serves on the board of the Fire Island Art Residency. BIO: Emma Kohlmann was born in New York City in 1989, currently lives and works in Western Massachusetts. Graduating from Hampshire College with a Bachelor of Arts in 2011, she designed her own major in aesthetics and feminist theory, as well as drawing. Her primary medium is watercolor and sumi ink. In her recent experiments include replicating watercolor on canvas and textile. Kohlmann publishes her own artist’s books and other ephemera such as zines and t-shirts. She has exhibited works at 68 projects (Berlin), V1 Gallery (Copenhagen), KIT Gallery (Tokyo) and throughout the United States. BIO: A British artist of Balinese descent, Sinta Tantra was born in New York in 1979. She studied at the Slade School of Fine Art, University College London 1999–2003 and at the Royal Academy Schools London 2004–06. Highly regarded for her site-specific murals and installations in the public realm, commissions include; Folkestone Triennial (2017) Newnham College, Cambridge University (2016); Songdo South Korea (2015); Royal British Society of Sculptors (2013); Liverpool Biennial (2012); Southbank Centre (2007). 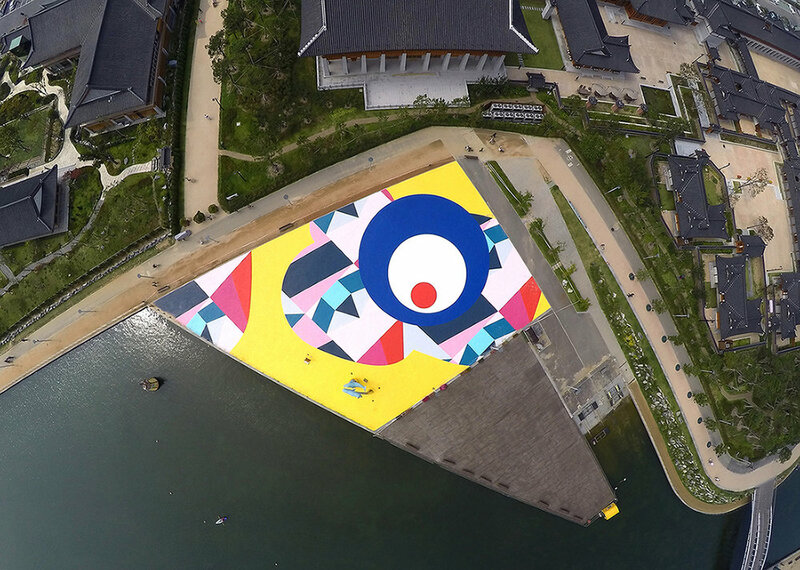 Tantra’s most notable public work includes a 300-metre long painted bridge commissioned for the 2012 Olympics, Canary Wharf, London. Solo shows include; A House in Bali (Jakarta Land & ISA Art Advisory, Jakarta 2017), Flatland: A Romance of Many Dimensions (Pearl Lam Gallery, Hong Kong 2016) and Fantastic Chromatic (Kristin Hjellegjerde Gallery, London 2015). A recipient of many awards including the Bridget Riley Drawing Fellow at The British School at Rome (2017); British Council’s International Development Award (2014); and Deutsche Bank Award (2006), Tantra’s work has been featured in both UK and international press including The Guardian, The Evening Standard, Tate Shots, Architectural Digest, Wall Street International Magazine, iD Indonesia, etc. STATEMENT: Tantra's bold interventions use colour abstractions that wrap themselves around architectural environments, transforming them in the process. The works are a hybridity of pop and formalism, a bricolage of colour and rhythm, an exploration of identity and aesthetics. Tantra challenges our understanding of geography whilst playing on notions of globalization / localization and deconstructing the modern obsession with brand. Themes within the work include the slippage between pictorial and physical space, of turning something 'inside out' and how we as bodies become submerged in surface and structure. "I describe the work as ‘painting on an architectural scale'. I create works that celebrate the spectacle, questioning the decorative, functional and social role of art. The compositional arrangements are rooted in formalism. I am intrigued when this formalism becomes 'relational' - when private becomes public and when the viewer becomes active. My work is an 'overlay' which inserts its identity within the pre existing - heightening a sense of fantasy within the functional. Colour exists as an integral aspect to my work and I am drawn to colour as a material which lies in-between the language of art and industry. Colour exists within its own structure - it is densely packed, hermetically sealed, contained. My work takes on a sculptural approach to 'colour-collage' where colour is 'cut' as opposed to filled, 'layered' as opposed to mixed, 'constructed' as opposed to emerged. Geometric boundaries are definitive and illusionary highs 'snap' into place as you walk around the work." BIO: Rena Detrixhe creates contemplative work combining repetitive process and collected or scavenged materials to produce meticulous, large-scale objects and installations. Her recent work explores systems of value in relation to land and water and slowness as a means of cultivating empathy and understanding. Detrixhe received her BFA from the University of Kansas in 2013, has exhibited in museums and galleries across the United States and is the recipient of numerous awards including a two-year studio residency with Charlotte Street Foundation in Kansas City, Missouri. Recent exhibitions include Ephemera at the Nerman Museum of Contemporary Art in Overland Park, KS, and a solo exhibition at the Philbrook Museum in Tulsa, Oklahoma. Detrixhe has spent the past two years as a Tulsa Artist Fellow in Tulsa, Oklahoma. STATEMENT: I weave carpets from dust, transform seeds into lace, suspend a fleeting moment of rain droplets on window into a solid cast form. Guided by the poetic and inherent qualities of a material and a personal interest in history, memory and geography, I respond. I might become immersed in conversation with a single tree, the collective memories embedded in soil, or an entire geological epoch, always searching for deeper understanding of environment, of relationships, and of place. In my recent work I engage in laborious processes, refining soil and sculpting it into delicate ephemeral sculptures that investigate the complicated history of the landscape and systems of value. I pursue a poetic understanding of time, material, history, and place, along with a constant reckoning of human impact. BIO: Las Hermanas Iglesias is the project-based collaboration of Lisa and Janelle Iglesias. The sisters also pursue distinct individual practices grounded in Sculpture and Drawing. Lisa received her MFA from the University of Florida where she is now an Assistant Professor. Janelle earned her degree in Sculpture from VCU and recently relocated to Southern California. 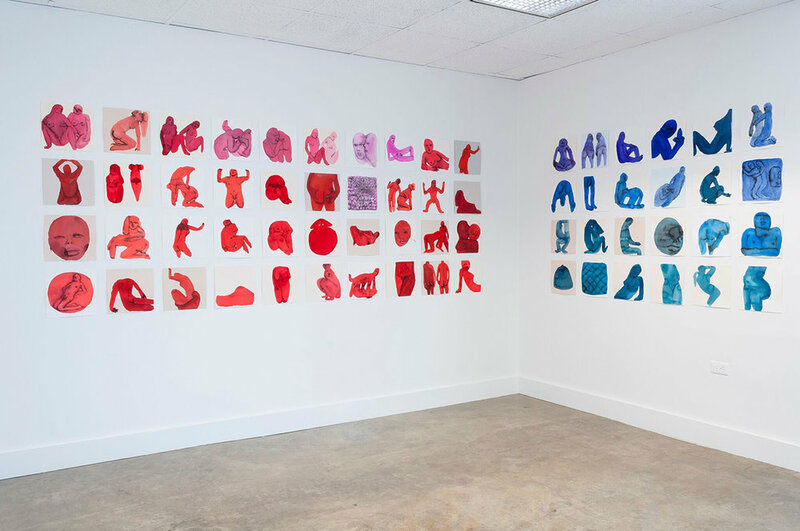 The sisters’ individual & collaborative work has been exhibited at El Museo del Barrio, the Queens Museum, Sculpture Center and Abrons Art Center, among others. As a team they’ve been artists in residence at the Cité Internationale des Arts through LMCC’s Paris residency program and more recently at Fanoon: Center for Print Research at VCU Qatar. Their individual and collaborative work has been supported by the Queens Council for the Arts, NYFA, NALAC, The Joan Mitchell Foundation and the Pollock-Kranser Foundation. BIO: Camille Lee (b. 1988, Seoul) has been working on various themes of minority issues mainly about herself and the communities around her. Her works are formed around familiar ready- made products or forms, exploring the counter play between her conceptual functions and the familiar contexts held by the audience. They act as deconstructions of everyday life and the implications of an ontological question about the social structure that we call daily life. Camille has had numerous exhibitions in U.S. and South Korea. She lives and works in the NYC area. BIO: Initially trained as a miniature painter from the National College of Arts, Lahore, Pakistan, Mahwish Chisty has aggressively combined new media and conceptual work with her traditional practice. Ms. Chisty has exhibited her work nationally and internationally at venues like University of Technology (UTS Gallery), Sydney, Australia; Boghossain Foundation-Villa Empain, Brussels; Utah Museum of Contemporary Art; Museum of Contemporary African Diasporan Arts (MOCADA), Brooklyn; Imperial War Museum, London, UK and Gandhara Art Gallery, Karachi, Pakistan, among others. In 2015 Ms. Chisty was awarded residencies at Yaddo, Saratoga Springs, NY; Chicago Cultural Center, Chicago, IL and Vermont Studio Center, Vermont, NY. Ms. Chisty also has works in public and private collections, including the Foreign office Islamabad, Pakistan, Fukouka Asian Art Museum, Fukouka Shi, Japan and Imperial War Museum, London. Ms. Chisty is also the recipient of the prestigious Guggenheim Fellowship. BIO: Mónica Palma was born in Mexico City and lives and works in Brooklyn.She studied visual art at the Universidad Veracruzana in Xalapa, Veracruz, and received her MFA in Painting and Printmaking at Virginia Commonwealth University. Her work has been shown at TSA (New York), 245 Varet Street (New York), Five Myles (New York), Ortega y Gasset Projects (New York) and Soloway Gallery (New York). BIO: Elise Rasmussen is a research-based artist working in photography, video and performance. She assumes the role of artist as investigator, uncovering lesser-known histories in an attempt to challenge the hegemonic record and re-think notions of "truth." Elise received her MFA from the School of the Art Institute of Chicago and her work has been exhibited, performed and screened at international venues including the Brooklyn Museum (NY), CCS Bard Museum (Annandale-on-Hudson), Night Gallery (LA), Pioneer Works (NY), the Irish Museum of Modern Art (Dublin), and Erin Stump Projects (Toronto). BIO: Chromati’s work has most recently been displayed at the Untitled Art Fair, Miami and featured on Art News, i-D, Cool Hunting, and in the 2018 Spring issue of Juxtapoz Magazine. She received her BFA from Pratt Institute and is currently working in her studio located in Bedstuy, Brooklyn. BIO: Katiushka Melo (b. 1977) is a Brooklyn based interdisciplinary artist, born in New York and raised by Chilean parents. Her work often addresses the challenging questions about the role and representation of women in modern society. She often gathers historical artifacts from other women, incorporating them into her performance practice. Through the interaction created while making food, she finds meaning in the daily rituals of different cultures, collaborating with woman from different tribes and breaking bread in order to understand cultures distant from her own. Her work has been exhibited in the Americas, Europe and Asia, most recently at Miami Art Basel and a solo show at Veracruzana Cultural Center for the Arts in Mexico. BIO: Rebecca Reeve was born in London, England. She received her Bachelor of Fine Arts degree at Bath Spa University and a Masters of Visual Arts at the University of South Wales, Australia. Her photographs have been exhibited nationally and internationally including La Biennale de Montreal, (Canada), Fries Museum, Berlin, (Germany), Museum of Latin American Art, (Buenos Aires), EFA Project Space, (NYC) the Masur Museum of Art, (Louisiana) and as part of the Hermès artist in window program series in NYC. 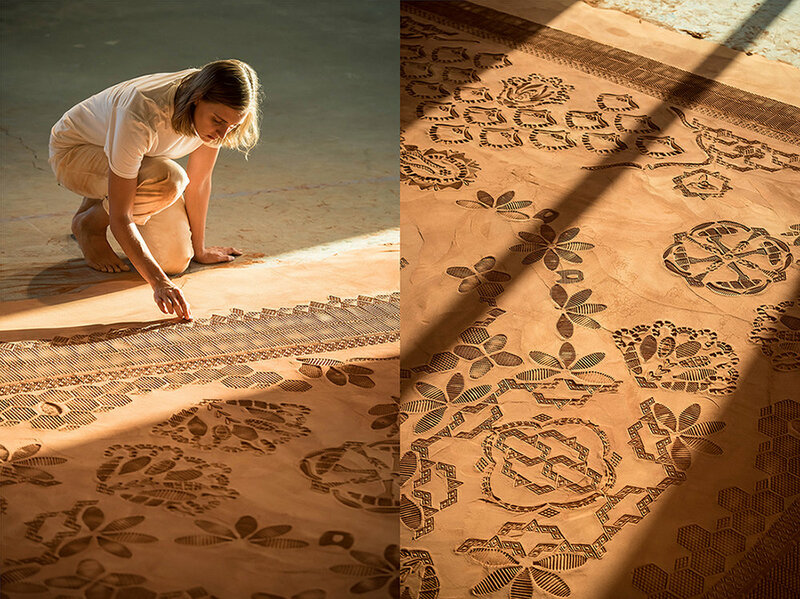 In 2013, she was Artist in Residence at Everglades National Park and was the recipient of the Artist in Exploration grant underwritten by Rolex. In 2016 she was the Artist-in-Residence at Joshua Tree National Park. She lives and works in New York City. STATEMENT: I am a British artist working in sculpture, painting and photography. I produce temporal site-specific works situated in natural settings. I am interested in the ways in which we experience the natural environment. My work explores the spaces between the interior and the exterior, using familiar household objects and cultural association as a means of activation and experimentation in perceptual experience. I employ the performative method of en plein air painting, to record my experience onto an object. In the resulting photographs my response to the environment is juxtaposed against the back drop of the landscape itself. A metaphor for the human condition and a meditation upon the union of interior and exterior landscape, notions of duality, intrinsically polarizing in nature, are a common theme throughout my work.